I have been frequently heading out to the Mission Trails and to make sure it stays exciting, I have been trying to night ride as much as possible. You can read about my original trip report to the Mission Trails here. One day I will finally finish my comprehensive guide to the Mission Trail system, but I keep finding new sections when riding. At this point, I don’t feel like I have mastered the trail, so the guide will have to wait a little longer. As I have explored the mission trails a little further, it seems there are 3 main trails: The paved trail that travels to the birding center, the named trails (there are 6 named trails for on one side), and the cattle gate trail ( that’s what I call it at least). For this night ride, on October 17th, I only rode the named trails, which totals approximately 7 miles. This night ride was specifically to prepare to lead Team Adventures With BeeGee on its first official night ride. One other nice thing about night riding is the quiet and the abundance of wild life. Levy Run will be the first mountain bike trail from the parking lot. Levy is a great beginner trail to get you warmed up before moving onto the harder trails. 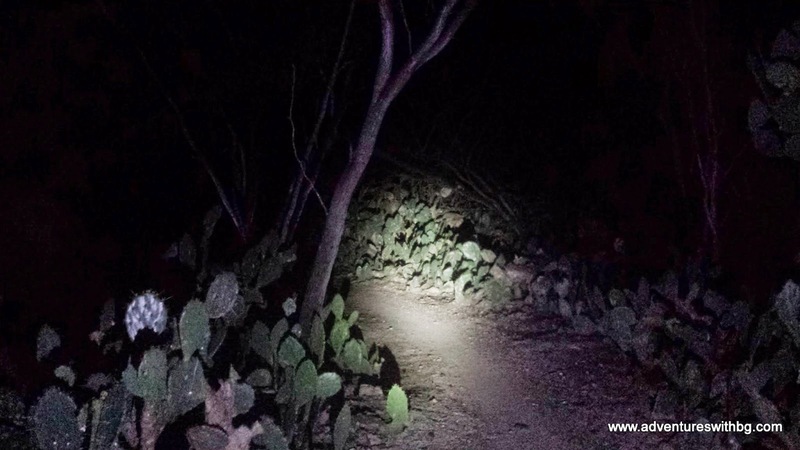 While being an easy trail, the path is surrounded by prickly pear cactus, which makes it very intense if you've never been on a night ride. Use this trail to shake the rust off and get to the harder trails, either Jackhammer Trail or the Cattle Gate Trail. Jackhammer is rated as intermediate trail and has a little bit of everything you could want on a mountain bike trail. This makes it a pretty fun trail because of the varied features. The trail starts off fairly smooth and flowy through a nice wooded section. In addition, there are a few curves to keep you on your toes without going overboard. Moreover, there are multiple mounds to get a little air and a few berms for fast corners (not that I ride fast at night). All of the features of Jackhammer make for an exciting/intense ride for the right level of thrill at night. Jackhammer also takes you past a small creek (it actually had a decent amount of water this time) and as I rode past, I am pretty sure I smelled wild hogs. That was a wee bit scary, but luckily, they left me alone. After a while, Jackhammer ends where Pooh Forest Trail. As its name suggest, Pooh Forest did stink a little during this ride. It recently rained and I guess that is how the trail got its name. The trail takes you through oak trees and the whole area is thicker/darker than any other section in the Mission Trail system. I feel like Pooh Forest is the creepiest trail for a night ride, so you might want to bring a friend(I wish I had) or just get out there and ride if you like the scary. Pooh Forest Trail has very tight curves and they happen frequently. I felt like this really kept my speed in check as I navigated all the turns. Plus, if you love spider webs in your face, then this trail is for you. I was absolutely covered in webs by the time I made it out of the woods. After all the twists and turns, you are lead on a short backtrack too where El Gato Trail begins. El Gato Trail is a pretty short trail, but it is also the most intense on a night ride. El Gato uses the large earthen walls of the canal to create big climbs and fast down hills. Also, the pump track is just a little ways in. I am not brave enough to do much of the track during the day, so I had no desire to try it out during a night ride. However, I recommend being extremely cautious on El Gato. It is easy to build up speed and fly through the wide turns, but there are low hanging branches (I bounced my head off a branch that night) and it is easy to out ride your light at those speeds. Finally, El Gato takes you back across the paved path and ends at Champion Run Trail. Champion Trail, in my opinion, is the easiest segment at the Missions Trails. It is mostly a straight trail that parallels the paved path. The trail is a little on the boring side and begins the trek back to the parking lot. Plus, the path is lined by tall grass that likes to reach out and touch you (it makes me so itchy). After this short stretch, you reach the Final Stretch. The Final Stretch is the last trail and another very short ride. Final stretch begins with a tight jump between 2 trees and has multiple mounds to jump. In addition, there are a few tight turns, but overall the trail can be ridden at a fast pace. This segment ends back on the paved main trail and it’s a short ride back to the parking lot and your car. If you love mountain biking, but riding the some old trails is getting a little boring, go ahead and try out night riding. While, night riding isn't allowed at every trail, it’s a great way to experience a trail from a new perspective. This will definitely bring the life back to trail system. Moreover, night riding can be an expensive venture, but it doesn't have to be. Bike lights can be expensive, so I ended up buying a cheap light from Amazon for around $15 (it is still very bright). If you night ride what gear do you use to keep you safe at night? If you like the blog, go ahead and follow us on Facebook. Who doesn't like jumps? Or spiderwebs on their face for that matter? This guys likes jumps. Strongly dislike spiderwebs tho. They are not for me. Are those the trails at Mission Nature Park. I may have walked on one of those for a bit. Yes. The sign in the parking lot says "Mission Nature Park". The trails are off Conway Ave. I loved ur nite ride blog, Jarrett. Except for imagining spider web going in my face, wild hogs on the Pooh trail. Youngun, you should have had someone with you. Some of those branches could knock you out. How far ahead can you see with the light? Is it just on bike or do you have one on your head too? Be safe. Great reading your blogs. Thank you for the Support and I'm glad you enjoyed it! I've been out there enough, I've got most of them memorized. Plus, I generally ride slow enough to see any danger well in advance. You are right tho, I do need to find some riding buddies from the area. As far as lights go, I have a really bright one on my bike and I wear a head lamp. You can see pretty far ahead and lightening isn't an issue for me unless I'm riding faster than 15 mph.